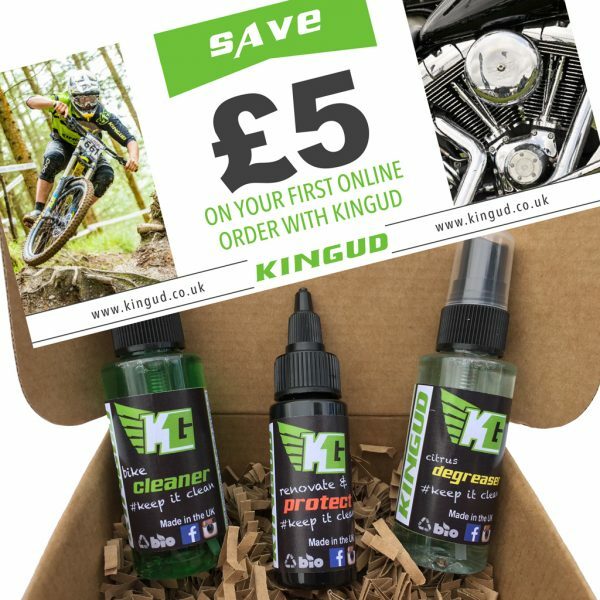 Kingud biodegradable bike cleaner is an eco friendly water based product that can be used on every component of your bike – even brakes and carbon composites. easy to apply it gets to work straight away gently lifting caked on mud and grime. Non caustic, kind to your bike and kind to the environment. If you purchase this product you will earn 80 Reward Points! Worth £0.40! Sure you can blast everything with the neat cleaner but you will use a lot less if you let it soak in and gently agitate baked on mud with a soft brush before rinsing away. Kingud bike cleaner can be used on all sufaces including tyres, seals and carbon fibre – you can even use it to clean your brakes. Its unique ingredients make it a powerful cleaner that leaves no residue for a Kingud finish every time. Avoid using on hot surfaces or in direct, strong sunlight. For non factory finishes its always advisable to test on a small, inconspicuous area first. Ensure brake components are properly rinsed after cleaning. Many modern composite bikes have surfaces which can be easily damaged by harsh, caustic based cleaners. Kingud eco friendly bike cleaner is a water based product which lifts mud, dirt, salt, brake dust, oil, and insect remains quickly and safely from wet or dry surfaces. It will help keep your favourite ride in pristine condition. Available in 1 litre bottles or 2.5ltr, 5ltr and 25ltr jerrycans and as money saving concentrated “shots”.